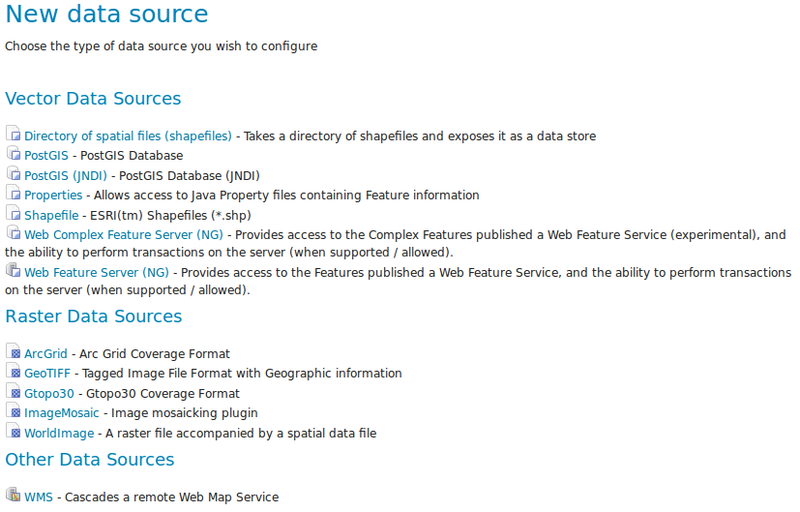 This tutorial walks through the steps of publishing a Shapefile with GeoServer. This tutorial assumes that GeoServer is running at http://localhost:8080/geoserver. First let’s gather that the data that we’ll be publishing. Download the file nyc_roads.zip. 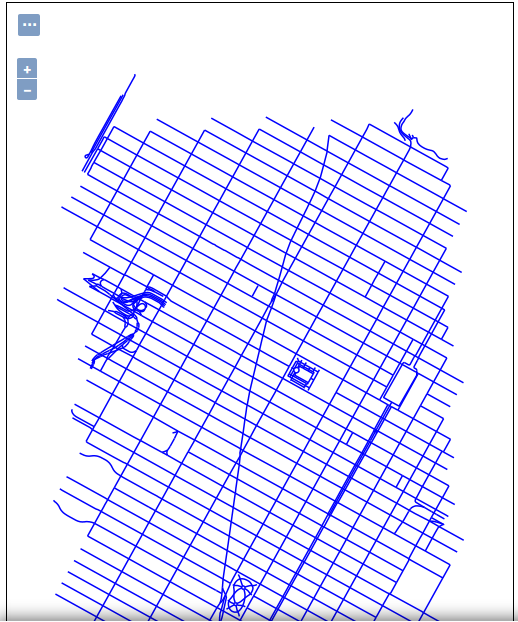 This archive contains a shapefile of roads from New York City that will be used during in this tutorial. Move the nyc_roads directory into <GEOSERVER_DATA_DIR>/data, where <GEOSERVER_DATA_DIR> is the root of the GeoServer data directory. If no changes have been made to the GeoServer file structure, the path is geoserver/data_dir/data/nyc_roads. The next step is to create a workspace for the shapefile. A workspace is a container used to group similar layers together. This step is optional if you’d like to use an existing workspace. Usually, a workspace is created for each project, which can include stores and layers that are related to each other. In a web browser, navigate to http://localhost:8080/geoserver. Log into GeoServer as described in the Logging In section. Navigate to Data ‣ Workspaces. Click the Add new workspace button. 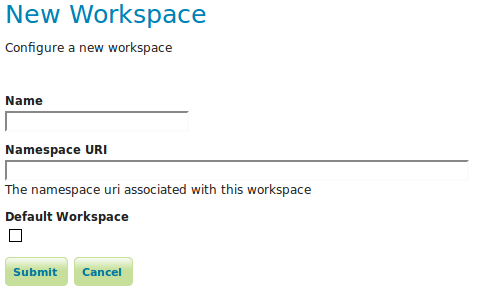 You will be prompted to enter a workspace Name and Namespace URI. Enter the Name as nyc and the Namespace URI as http://geoserver.org/nyc. A workspace name is a identifier describing your project. It must not exceed ten characters or contain spaces. A Namespace URI (Uniform Resource Identifier) can usually be a URL associated with your project with an added trailing identifier indicating the workspace. The Namespace URI filed does not need to resolve to an actual valid web address. Click the Submit button. The nyc workspace will be added to the Workspaces list. Once the workspace is created, we are ready to add a new store. The store tells GeoServer how to connect to the shapefile. You should see a list of stores, including the type of store and the workspace that the store belongs to. In order to add the shapefile, you need to create a new store. Click the Add new Store button. 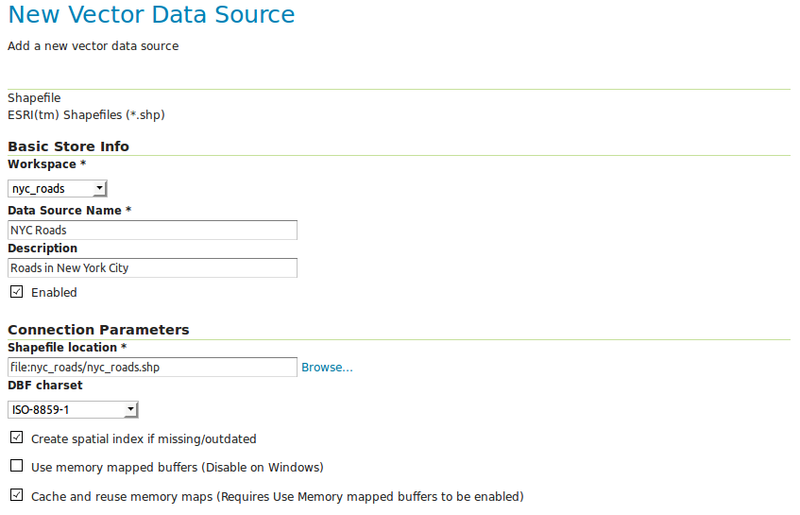 You will be redirected to a list of the data sources supported by GeoServer. Note that the data sources are extensible, so your list may look slightly different. Click Shapefile. The New Vector Data Source page will display. Begin by configuring the Basic Store Info. Select the workspace nyc from the drop down menu. Enter a brief Description (such as “Roads in New York City”). 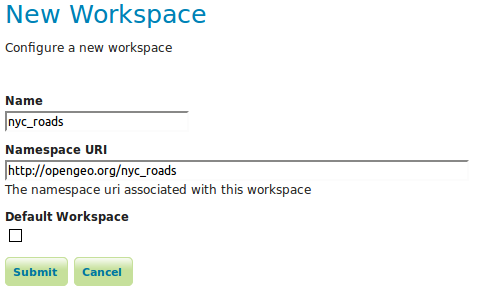 Under Connection Parameters, browse to the location URL of the shapefile, typically nyc_roads/nyc_roads.shp. Click Save. You will be redirected to the New Layer page in order to configure the nyc_roads layer. Now that the store is loaded, we can publish the layer. On the New Layer page, click Publish beside the nyc_roads layer name. The Edit Layer page defines the data and publishing parameters for a layer. Enter a short Title and an Abstract for the nyc_roads layer. Generate the layer’s bounding boxes by clicking the Compute from data and then Compute from native bounds links. Click the Publishing tab at the top of the page. We can set the layer’s style here. 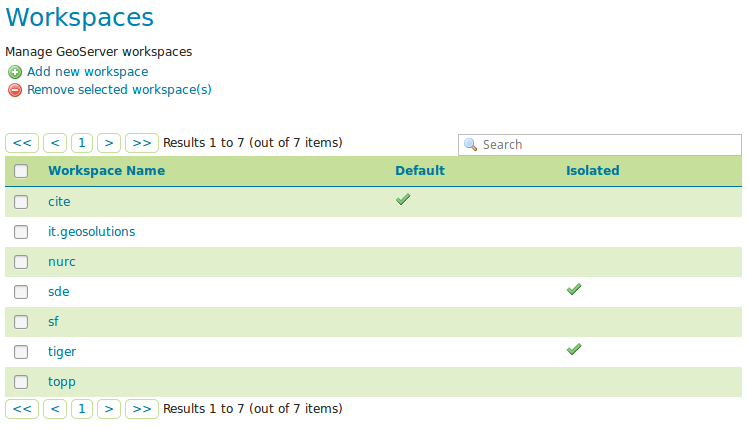 Under WMS Settings, ensure that the Default Style is set to line. Finalize the layer configuration by scrolling to the bottom of the page and clicking Save. 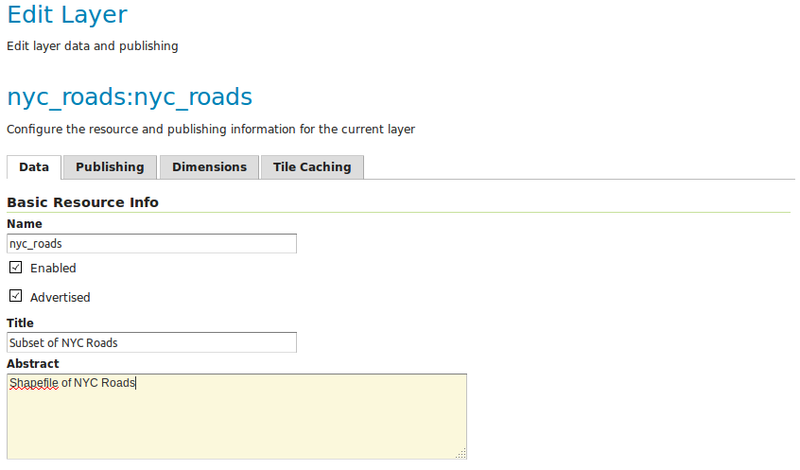 In order to verify that the nyc_roads layer is published correctly, we can preview the layer. Navigate to the Layer Preview screen and find the nyc:nyc_roads layer. Click the OpenLayers link in the Common Formats column. An OpenLayers map will load in a new tab and display the shapefile data with the default line style. You can use this preview map to zoom and pan around the dataset, as well as display the attributes of features.